Zulkifli S.A*1, Mohamad CWSR1, Abdullah AH1,2. Gastroenteritis refers to syndromes of diarrhea or vomiting due to non-inflammatory infection in the upper small bowel or inflammatory infection in the colon; it is usually self-limiting, and may be caused by bacteria, viruses, or parasites . 80% caused by gastrointestinal bacteria which is Escherichia coli and 15% are caused by Staphylococcus saprophyticus . Normally, bacterial infections are the most common problem that leading to the gastrointestinal disease and caused life-threatening infections. Bacterial infections are important targets for the detection and identification in various field including medicine and public health , . Besides that, that are other bacterial strain that cause gastroenteritis such as Salmonellae, Escherichia coli, Shigella and Staphylococcus aureus which are established infection inside human stomach lining. The conventional techniques that used in the clinical laboratory to identify bacterial infection are generally invasive, time consuming, sophisticated and requires highly skilled staffing to handle the device . 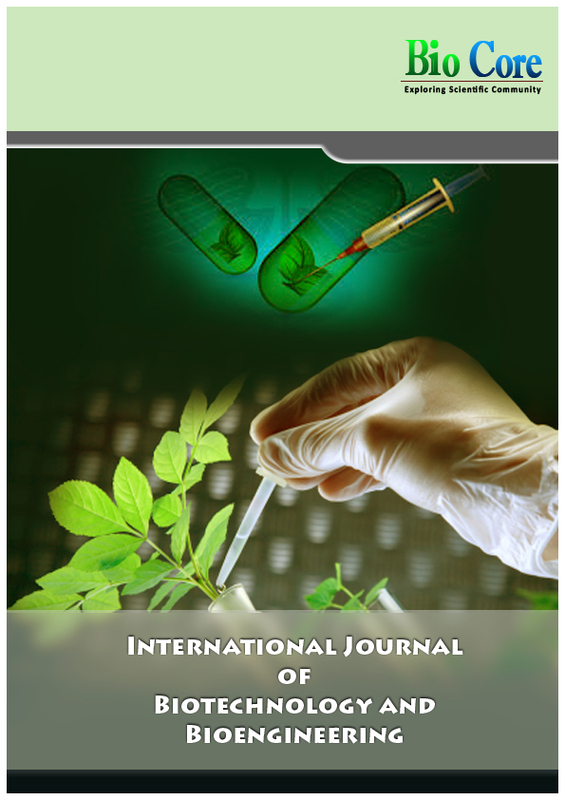 In general, the electronic sensing eased the detection of odour from gastrointestinal patient exhaled breath and as well as to identify and classify various bacterial species cultured in vitro . With the intention to enhance the pre-diagnosis of gastrointestinal disease and fast detection; determination of biomarker using different sample, such as urine, exhaled breath and in vitro bacteria culture will provides a foundation for further sensing based assay development as a mean for early screening. This work also opens up potential research in screening of pathogenic human bacteria. The electronic nose is an electronic system that tries to imitate the structure of human nose . It is designed to detect and discriminate among complex odors using sensor array . The gas sensor array in electronic nose comprises several non-specific sensors and will generate characteristics patterns when exposed to odorant materials . Electronic nose also poised to capture a hold in the healthcare industry, as analysis human odors to monitor the health of person . In the last decades, the development of sensitive analytical techniques such as gas chromatography mass spectrometry (GCMS) or ion mobility spectrometry, the clinical utility was evaluated for different disease for instance screening for lung and colorectal cancer ,. 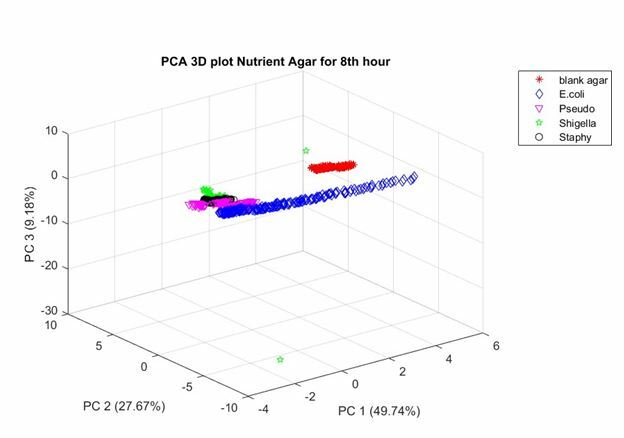 This paper conducts the analysis of bacterial detection as an early screening using electronic nose and proves the performance of electronic nose has ability to detect the bacteria culture in agar media culture. The data discussed here were collected at Biomaterial Laboratory, School of Mechatronic Engineering, University Malaysia Perlis, Arau, Malaysia. The experiment was conducted in a vertical laminar flow workbench exclusively to avoid disturbance from outside environment. For this study, data was collected and obtained based on the experiments. The bacterial sample will be cultured inside the well plates using different types of agar and incubate for 24 hours. One well plate without bacteria culture acts as a control sample and used as a reference point. Within 24 hours, the sample plate will be sniff using electronic nose in sterile and closed place to avoid contamination and odors from outside. All data collected will be analyzed and interpreted based on the previous study. The experiments will repeat at least for 5 times for data measurement to compare and correlate with the sensitivity and specificity of electronic nose in detection of clinical study. Nutrient agar was prepared by using 10g of nutrient agar powder mixed with 300ml of distilled water. Then, the solution was heated on hot plate to make sure all agar powder is dissolved before tilled up the bottle until 500 ml of distilled water (dH2O). The agar solution need put into autoclave at 121°C for sterilization. An autoclave used to sterilize equipment supplies by exposed them to high pressure saturated steam at 121 °C (249°F) for around 15–20 minutes depending on the size of the load and the contents. After completely sterile in the autoclave, agar solution must be cooled within 15 minutes in room temperature. After that, the agar solution is poured into petri dishes. Culture medium must be able to provide all the essential nutrient, ion and moisture, to maintain correct pH and also able to neutralize any toxic material produced for growing pathogens successfully . Four different types of bacterial strain that will be used in this research which are Staphylococcus aureus, Pseudomonas aeruginosa, Escherichia coli and Shigella, as described in Table 3.1. For this cultivation technique, cotton swab is used to streak the bacterial sample over the plate in a media agar. Culture media means the process of bacterial or other biological entity in a medium plate. The petri dishes are labeled and sealed. Then, the plates are incubated at 37°C. The main purpose of incubation is to provide a suitable environment for the growth of bacteria. A temperature of 37°C is the optimum temperature for the bacteria from human gut to grow. To increase the reliability of measure, each odor from bacteria strain were tested with a 2-hour break between incubation based on the growth curve of bacterial. The total number of data collection represents five times repeated measurement using electronic nose. For this study, all bacteria samples must be handle with careful in order to prevent contamination in the samples. Electronic nose (e-nose) technology consists of gas sensors array and provides a sort of fragrance by detecting chemical compound through multiple sensors. For each sensor, the array gives different electrical response to a particular target volatile. First developed in the 1980’s, it is attempt to mimic the human olfactory system ,. This electronic nose equipment called as BactSense that composed multiple sensors from metal oxide semiconductor. The sensitivity of metal oxide semiconductor gas sensors is activated at high temperature, it is known that the optimal temperature changes according to the gas at which the sensor exposed , . It is being developed to detect and discriminate odor analysis and has been introduced in many field other than disease diagnosis such as food engineering and environmental control . The sampling procedure is beginning after bacteria is cultured onto media agar culture. The period of bacteria grows known as 0th hours. After that, bacteria were incubated within 2 hours to produce headspace which emitted by bacterial strain. Each two hours, a BactSense electronic nose was used to sniff odor emitted from bacterial culture without changing its composition and properties. The sensor array in this study is constructed due to the high sensitivity and quick response of the sensors to metabolites. The electronic nose system consists a few sensors which are TGS2620, TGS826, TGS816, TGS2600, TGS2602, TGS822, MQ136 and SHT1x (temperature and humidity). The BactSense electronic nose is set up as shown in Figure 1. The target medium is covered by closed container and the odor is sniffed immediately to ensure the consistency and avoided contamination from outside environment. The instrument measurement parameter as listed in Table 2. For the purge cycle, the headspace sample will flow into the sensor chamber using air pump. The air sample hold in the chamber will exposed the sensor for optimum interaction and sensor response. For the purge cycle, the ambient air flew through an active carbon filter by using air pump. The clear reference air flew into the sensor chamber and flash out the air sample. For data analysis, MATLAB R2017a used for feature projection and classification performance. Principal component analysis (PCA) is implemented for clustering among the bacterial strain, while for the classification performance, multivariate prediction model is used.The performance of each classifier is discussed and compared. the data ,,. Furthermore, PCA was used as an exploratory analysis plotted in 3D graphs to visualize between group separation , . There are two or three dimension to plotted the variance. This technique also mainly used to reduce the dimensionality of raw data. Support Vector Machine (SVM) is a new machine learning method which is used to optimize to analyze the sensor array response signals. Results in a form of graphs are shown for visual classification and classification accuracy in numerical and percentage by using above mentioned feature projection (principal component analysis) and classification technique such as KNN, SVM and neural network (NN). Four different types of bacterial strain namely, Staphylococcus aureus, Pseudomonas aeruginosa, Escherichia coli and Shigella were cultured and the odours emitted were measured start from zero hour which means after isolation until 24 hours for incubation process at 37ºC. hence, data analysis was collected for 0th hour, 2th hours, 4th hour, 6th hour, 8th hour and 24th hour as presented in visual graph with colour indicator. The results obtained using PCA as feature extraction for the clustering bacterial strain as shown in Figure 2 until Figure 7. 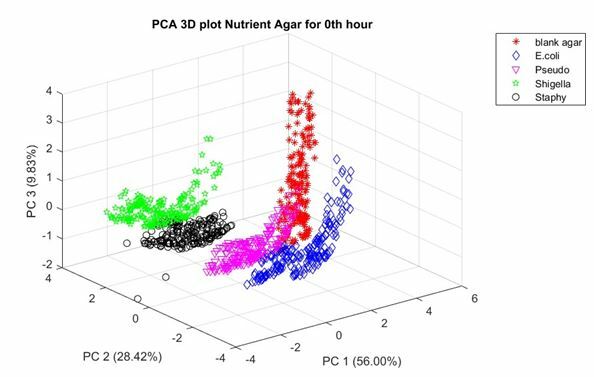 The PCA plot for zero hour indicates that principal component 1 is 56.00%, principal component 2 is 28.42% and principal component 3 is 9.83%. 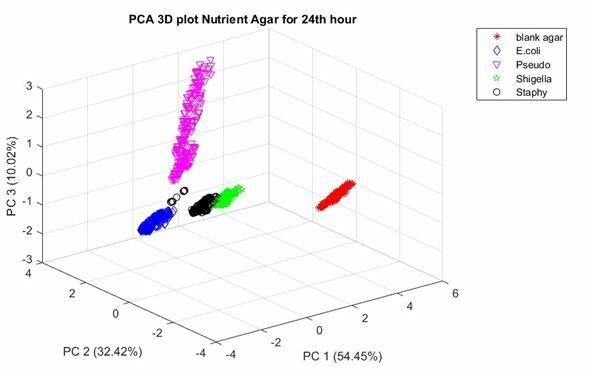 PCA plot for 2th hours as shown in Figure 3 indicates that principal component 1 is 61.30%, principal component 2 is 28.54% and principal component 3 is 4.46%. 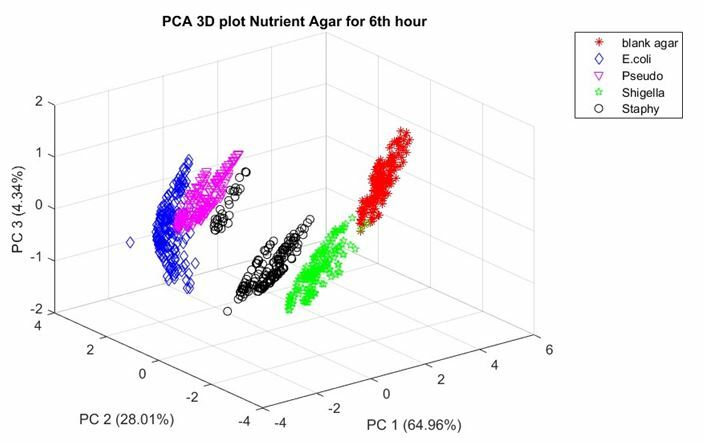 PCA plot for 6th hours as shown in Figure 5 indicates that principal component 1 is 61.30%, principal component 2 is 28.54% and principal component 3 is 4.46%. 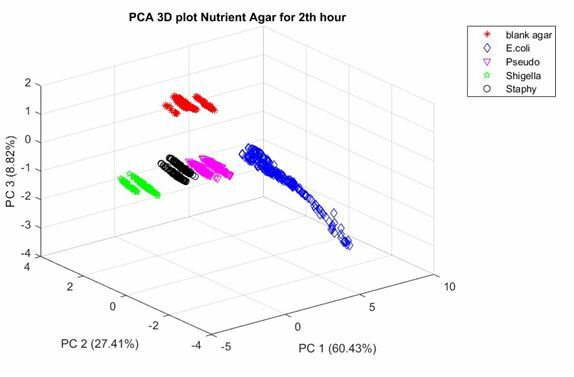 PCA plot for 24th hours as shown in Figure 7 indicates that principal component 1 is 61.30%, principal component 2 is 28.54% and principal component 3 is 4.46%. Based on the results obtained, the analyses show different grouping of bacteria species can be cluster into different region as early 2 hours of bacterial growth. This proves that electronic nose was able to discriminate different odours emitted from different bacterial species. The dimension which reduced by PCA analysis were used as input for three classification system which are known as K-Nearest Neighbour (KNN), Support Vector Machine (SVM) and Neural Network (NN) techniques. The performances of classifications of electronic nose system were presented and compared in term of classification accuracy, sensitivity and specificity. To estimate the performance of the classifier, the experimental results were randomly generated 60/40 training/test splits of the data during cross validation process. According the results obtained in the Table 2, the highest performance of accuracy for overall classifier that archived 100% for dataset of 0th, 2th, 4th and 24th hours respectively. For 6th and 8th hours dataset, neural network was not able to achieve higher accuracy of data samples. Table 3 represents the sensitivity and specificity for different classifier for each bacteria species in nutrient agar media for 0th hour of growth. From the perspective of sensitivity and specificity, it can be concluded that all classifiers are good in classifying their group which achieved 100% of sensitivity and specificity. Table 4 represents the sensitivity and specificity for different classifier for each bacteria species in nutrient agar media for 2th hour of growth. From the perspective of sensitivity and specificity, it can be concluded that all classifiers are good in classifying their group which achieved 100% of sensitivity and specificity. Table 5 represents the sensitivity and specificity for different classifier for each bacteria species in nutrient agar media for 4th hour of growth. From the perspective of sensitivity and specificity, it can be concluded that all classifiers are good in classifying their group which achieved 100% of sensitivity and specificity. Table 6 represents the sensitivity and specificity for different classifier for each bacteria species in nutrient agar media for 4th hour of growth. From the perspective of sensitivity and specificity, it can be concluded that all classifiers are good in classifying their group which achieved 100% of sensitivity and specificity. Table 6 represents the sensitivity and specificity for different classifier for each bacteria species in nutrient agar media for 6th hour of growth. Bacteria species E. coli obtained in 100% for specificity of SVM classifier and sensitivity of neural network classifier. Bacteria species P. seudomonas obtained 100% in KNN classifier and sensitivity of SVM classifier. Shigella do not achieved 100% of sensitivity for neural network classifier. Staphyloccocus aureus only obtained 100% for SVM specificity and neural network sensitivity. Table 7 shows the sensitivity and specificity for different classifier for each bacteria species in nutrient agar media for 8th hour of growth. Bacteria species E. coli do not obtain 100% for specificity of SVM classifier. Bacteria species P. seudomonas only obtained 100% for specificity of SVM classifier. Shigella do not achieved 100% of specificity for KNN classifier and also specificity for SVM classifier. Staphyloccocus aureus only obtained 100% for SVM classifier sensitivity. Table 8 represents the sensitivity and specificity for different classifier for each bacteria species in nutrient agar media for 4th hour of growth. From the perspective of sensitivity and specificity, it can be concluded that all classifiers are good in classifying their group which achieved 100% of sensitivity and specificity. This paper proposed classification of single bacterial species targeted for gastrointestinal infection. The odors emitted from bacterial strain is able to identify using electronic nose called as BactSense. Obviously, during 2 hours of bacteria growth, the classification percentage accuracy of odors released is high. From all the classifier, support vector machine (SVM) shows highest percentage accuracy approximately 100% compared to KNN and neural network. The results obtained from this experiment could classify different types of bacterial strain for each 2 hours of bacterial growth period. This would give advantage in gastrointestinal disease for detection in shot time rather than invasive method that take a few days to analyze the medical process. As a conclusion, electronic nose system able to cluster and classify different types of bacterial strain which is mimic the human sense of smell. It is important to have an effective screening tool to speed up the effectively diagnosis of gastrointestinal infection at an early stage and can be used in larger scale of population to reduce the number of imputation among patients. 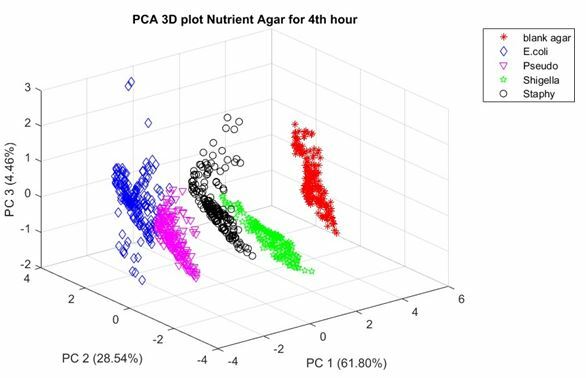 PCA plot for 6th hours as shown in Figure 6 indicates that principal component 1 is 61.30%, principal component 2 is 28.54% and principal component 3 is 4.46%. C. N. Fhogartaigh, “Bacterial Gastroenteritis Medication,” pp. 2–5, 2017. A. Roine et al., “Rapid and accurate detection of urinary pathogens by mobile IMS-based electronic nose: A proof-of-principle study,” PLoS One, vol. 9, no. 12, pp. 1–11, 2014. L. Krasny, R. Hynek, and I. Hochel, “Identification of bacteria using mass spectrometry techniques,” Int. J. Mass Spectrom., vol. 353, pp. 67–79, 2013. E. Tait, S. P. Stanforth, S. Reed, J. D. Perry, and J. R. Dean, “Analysis of pathogenic bacteria using exogenous volatile organic compound metabolites and optical sensor detection,” RSC Adv., vol. 5, no. 20, pp. 15494–15499, 2015. H. Shafiek et al., “Using the electronic nose to identify airway infection during COPD exacerbations,” PLoS One, vol. 10, no. 9, pp. 1–16, 2015. J. Gutiérrez and M. C. Horrillo, “Talanta Advances in artificial olfaction : Sensors and applications,” vol. 124, pp. 95–105, 2014. C. Peng, J. Yan, S. Duan, L. Wang, P. Jia, and S. Zhang, “Enhancing electronic nose performance based on a novel QPSO-KELM model,” Sensors (Switzerland), vol. 16, no. 4, 2016. J. Gardner and T. Vincent, “Electronic Noses for Well-Being: Breath Analysis and Energy Expenditure,” Sensors, vol. 16, no. 7, p. 947, 2016. A. De Vincentis et al., “Breath-print analysis by e-nose for classifying and monitoring chronic liver disease: A proof-of-concept study,” Sci. Rep., vol. 6, no. April, pp. 1–9, 2016. F. Tian, Z. Liang, L. Zhang, Y. Liu, and Z. Zhao, “A novel pattern mismatch based interference elimination technique in E-nose,” Sensors Actuators, B Chem., vol. 234, pp. 703–712, 2016. T. O. Egwuatu, F. T. Ogunsola, I. M. Okodugha, and B. Jide, “Effect of Blood Agar from Different Animal Blood on Growth Rates and Morphology of Common Pathogenic Bacteria,” no. December, pp. 1237–1241, 2014. E. Westenbrink et al., “Development and application of a new electronic nose instrument for the detection of colorectal cancer,” Biosens. Bioelectron., vol. 67, pp. 733–738, 2015. L. Zhang, F. Tian, and G. Pei, “A novel sensor selection using pattern recognition in electronic nose,” Measurement, vol. 54, pp. 31–39, 2014. J. Yan, S. Duan, T. Huang, and L. Wang, “Hybrid feature matrix construction and feature selection optimization-based multi-objective QPSO for electronic nose in wound infection detection,” Sens. Rev., vol. 36, no. 1, pp. 23–33, 2016. L. Lavra et al., “Investigation of VOCs associated with different characteristics of breast cancer cells,” Sci. Rep., vol. 5, pp. 1–12, 2015. A. D. Wilson, “Advances in electronic-nose technologies for the detection of volatile biomarker metabolites in the human breath.,” Metabolites, vol. 5, no. 1, pp. 140–63, 2015. P. Jia, F. Tian, Q. He, S. Fan, J. Liu, and S. X. Yang, “Feature extraction of wound infection data for electronic nose based on a novel weighted KPCA,” Sensors Actuators, B Chem., vol. 201, pp. 555–556, 2014. H. Cheng, Z. H. Qin, X. F. Guo, X. S. Hu, and J. H. Wu, “Geographical origin identification of propolis using GC-MS and electronic nose combined with principal component analysis,” Food Res. Int., vol. 51, no. 2, pp. 813–822, 2013. C. Rees, A. Burklund, P.-H. Stefanuto, J. D. Schwartzman, and J. E. Hill, “Comprehensive volatile metabolic fingerprinting of bacterial and fungal pathogen groups,” J. Breath Res., 2017. M. B. Banerjee and T. Nandy, “Multivariate Preprocessing Techniques Towards Optimising Response of Fused Sensor from Electronic Nose and Electronic Tongue,” pp. 949–954, 2016. R. De Vries et al., “Integration of electronic nose technology with spirometry: Validation of a new approach for exhaled breath analysis,” J. Breath Res., vol. 9, no. 4, 2015. U. Siripatrawan and B. R. Harte, “Data visualization of Salmonella Typhimurium contamination in packaged fresh alfalfa sprouts using a Kohonen network,” Talanta, vol. 136, pp. 128–135, 2015.